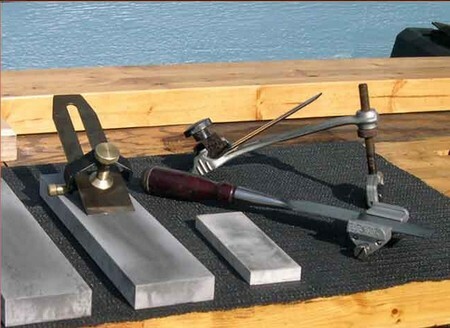 Flat plane blades called plane irons and chisels are fairly easy to sharpen; tools with curved blades are more tricky. All blades have two angles a grinding angle of 25 degrees and a sharpening (honing) angle of 30 degrees. New plane blades come with the 25 degree bevel ground on the front edge, but need to be sharpened before they are used. For sharpening blades you usually need an oil stone. There are three grades commonly available coarse, medium and line. Coarse stones are used for regrinding a blade. For sharpening it you need a medium or fine stone. Combina­tion stones (with two sides of different grades) are also available. Oil stones should be kepi in a suitable box which has wooden end pieces which are slightly shallower than the stone to prevent a blade being damaged when it runs off the edge of the stone. The box should be securely fixed to a workbench (or some­thing similar) when the stone is being used. Oil the stone lightly before use and clean it frequently by wiping it with a soft cloth or tissue. To resharpen an undamaged blade, hold il at an angle of 30 degrees to the stone (bevel side down) and rub it back­wards and forwards along the length of the stone until a burr (sometimes called a wire edge) builds up along its edge. Reverse the blade, lay it fiat on the stone and rub it backwards and forwards a few times to either remove the wire edge or bend it back. If it does not fall off, repeat the honing process applying slightly less pressure, until you get an edge which cuts paper cleanly. When sharpening blades which are wider than the stone, hold the blade at an angle so that the whole edge rests on the stone. The sharpening angle is very impor­tant and a honing guide should be used to help maintain the correct angle. Al­though 30 degrees is normally the op­timum angle, it is better to increase this to about 38 degrees when planing man-made boards such as chipboard and plastic laminates. If a blade is damaged if it has nicks in it has been mistreated or has rounded corners it will need regrinding. A coarse oilstone can be used, with the blade held at 25 degrees, but a grinding wheel is much quicker. Make sure that the blade is held squarely, securely and at the correct angle. Apply minimal pressure to avoid overheating (if this happens the tip of the blade will turn blue) and move the blade from side to side to ensure even grinding. Wheels tend to give a hollow-ground edge as the grinding surface is circular. You can get round this problem by using the side of the grinding wheel. After regrinding, use a medium grit oilstone for a few strokes to speed up the final honing on a line stone. Even if you have a honing guide, resharpening chisels and plane irons is hard work particularly when there is a lot of metal to remove. When it gels to the stage for regrinding, most do-it-yourself shops can arrange for this to be done fairly cheaply.